High Pressure Crossover (HPX)The KCM Stainless Steel High Pressure Crossover (HPX) line connects the driver side and passenger side High Pressure Oil Rails together. This results in a more balanced High Pressure Oil system with fewer pressure spikes (see Injection Control Pressure graphs below). In most trucks, the elimination of ICP spikes and balancing of pressures in the High Pressure Oil Rails will smooth operation and may even quiet the engine somewhat. You will NOT find a better HPX line ANYWHERE...PERIOD!!! The KCM HPX line is constructed from only the highest quality components. High Grade MIL-SPEC Stainless Steel tubing and aircraft quality steel fittings ensure thousands of miles of trouble-free operation. KCM even offers a LIFETIME Limited Warranty against manufacturers defects on their S.S. HPX lines! The High Pressure Oil System operates from 500psi to over 3000psi. Components of this system must be designed to handle these pressures on a CONTINUOUS basis. In addition to pressure, the high temparatures of the engine oil and underhood environment, high pulsation rate of the high pressure oil system and the general expansion, contraction and vibration of a running Powerstroke make for a tough operating environment. The proper design of a High Pressure Crossover line is far more than just picking some hose with a high enough pressure rating and having some fittings crimped on or bending up a tube and attaching it to the engine! Make sure the HPX line you purchase is an ENGINEERED SOLUTION and not just a "slapped together" hose or tube! •THOUSANDS of units in operation Without a Single Design Related Failure! If you're comparing the KCM HPX line to those offered by our competitors at a lower price, and wondering why this line is more expensive, now you know! 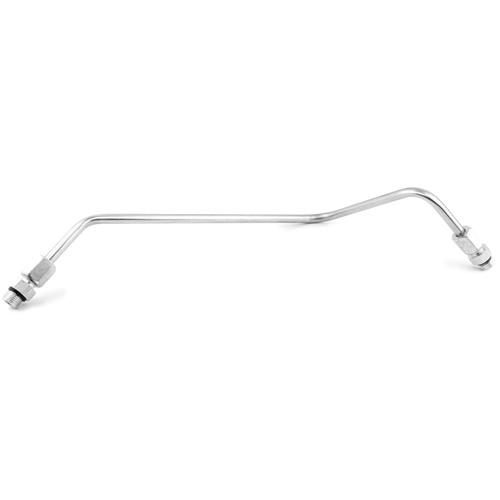 The KCM Stainless Steel High Pressure Crossover (HPX) line connects the driver side and passenger side High Pressure Oil Rails together. This results in a more balanced High Pressure Oil system with fewer pressure spikes (see Injection Control Pressure graphs below). In most trucks, the elimination of ICP spikes and balancing of pressures in the High Pressure Oil Rails will smooth operation and may even quiet the engine somewhat. Fits perfect, easy install, takes no more than 10 minutes to install, high quality line, far superior than the others on the market, definitely quiets out the clatter, if your OBS doesn't have one yet, then you are doing it wrong. the hpx tube is a great quality part. the tube is bent well, the fittings are very nice, and the o-rings are the perfect size. I like how it looks in the engine bay and it fit great! With a little patience it went on easily and instructions were well written. It seemed to quiet down the motor a little but I mainly wanted this just to keep both oil rails equal on pressure. Great product for the price and quality!! Easy to follow instructions and a straight forward installation. There was a noticeable difference in clatter at idle and I do notice a difference in acceleration especially from part throttle.